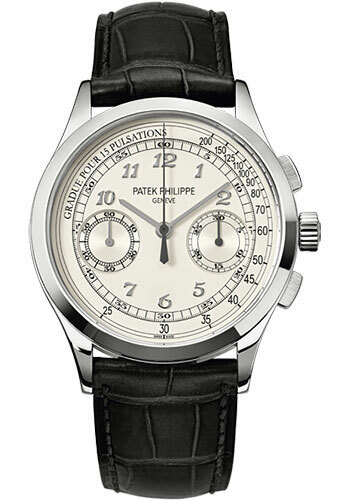 39mm 18K white gold case, sapphire crystal back, silvery white dial with gold applied numerals, manually wound Caliber CH 29-535 PS movement with chronograph with central chronograph hand and 30-minute elapsed time counter, seconds subdial, approximately 65 hours of power reserve, hand-stitched shiny black alligator strap with with square scales, fold-over buckle. Water resistant to 30 meters. 39.4 mm 18K white gold case, sapphire-crystal back, ebony-black opaline dial with gold applied Breguet numerals, caliber CH 29-535 PS manually wound movement with central chronograph hand and 30-minute elapsed time counter, seconds subdial, approximately 65 hours of power reserve, shiny black alligator strap with square scales, fold-over buckle. Water resistant to 30 m.
39mm 18K yellow gold case, sapphire crystal back, silvery opaline dial with gold applied hour markers, manually wound caliber CH 29-535 PS movement with column-wheel chronograph, chronograph hand, subsidiary seconds, and 30-minute counter, approximately 65 hour of power reserve, leather strap with fold-over buckle. Water resistant to 30 meters. 39.4 mm platinum case, sapphire-crystal back, blue graduated to black sunburst dial with baguette diamond hour markers, caliber CH 29-535 PS manually wound movement with central chronograph hand and instantaneous 30-minute counter, seconds subdial, tachymeter scale, approximately 65 hours of power reserve, shiny black alligator strap with square scales, fold-over buckle. Water resistant to 30 m.
39.4 mm 18 rose gold case, sapphire-crystal back, ebony-black opaline dial with gold applied Breguet numerals, caliber CH 29-535 PS manually wound movement with central chronograph hand and instantaneous 30-minute counter, seconds subdial, tachymeter scale, approximately 65 hours of power reserve, shiny black alligator strap with square scales, fold-over buckle. Water resistant to 30 m.